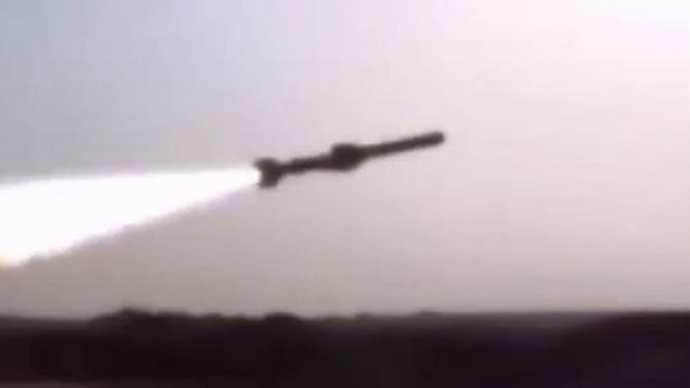 Iran has announced the mass production of Ghadir, a long-range anti-warship cruise missile. The homegrown missile reportedly features great precision, high destructive power and the ability to fly at low altitudes. “Today, we are simultaneously witnessing the launch of the mass production line and the delivery of this strategic and effective missile in the domain of defense and marine battle,” Defense Minister Brigadier General Hossein Dehqan told reporters at a ceremony of inauguration on Saturday. The homegrown missile is equipped with highly advanced radar, as well as anti-jamming and anti-electronic warfare systems. It has a range of 300 kilometers and is capable of flying at low altitudes. It can be launched from different types of vessels, even helicopters. Iran has developed its own drones, aircraft, vessels and electronics systems. The three-day Great Prophet 9 Maneuver held in the Persian Gulf in February showed the might of the Iranian navy. "The high precision, rapid reaction and high quality of these important products have incredibly increased the Armed Forces' combat power in the sky, sea and ground," Dehqan said. The minister spoke highly of the work completed by technical specialists, and stressed that new kinds of weapons currently under development will have even more impressive characteristics. “God willing, the Defense Ministry’s new missiles with much more advanced capabilities will be delivered to the Armed Forces next year,” Dehqan said. The first several Ghadir missiles were handed over to the naval forces of the Islamic Revolution Guards Corps (IRGC). IRGC Aerospace Force Brigadier General Amir Ali Hajizadeh said that Iran plans to replace its first generation missiles in 2016. Ghadir was first shown off in 2011. It was officially unveiled on August 24, 2014 in a special ceremony attended by Iranian President Hassan Rouhani and the country's defense chief. The production launch follows the recent presentation of new types of weapons. Earlier this month, Iran unveiled its first surface-to-surface missile defense system Soumar, which is capable of hitting targets with accuracy and high precision. Iranian authorities said the new missile is capable of eliminating various targets and is equipped with radars that make it precisely accurate, despite any radio electronic counter-measures from potential enemies. In recent years, Iran has frequently tested its new advanced weaponry as the Islamic Republic is eager to strengthen its defense sector. It has repeatedly stated that its military strength poses no threat to other countries, claiming the Islamic Republic’s defense doctrine is entirely based on deterrence of the enemy. Earlier, in November, Tehran presented its own copy of a US reconnaissance drone captured in 2014. The Iranian army possesses a wide arsenal of missiles capable of striking Israel and US military bases in the Middle East. Tehran also plans to increase the production of drones.